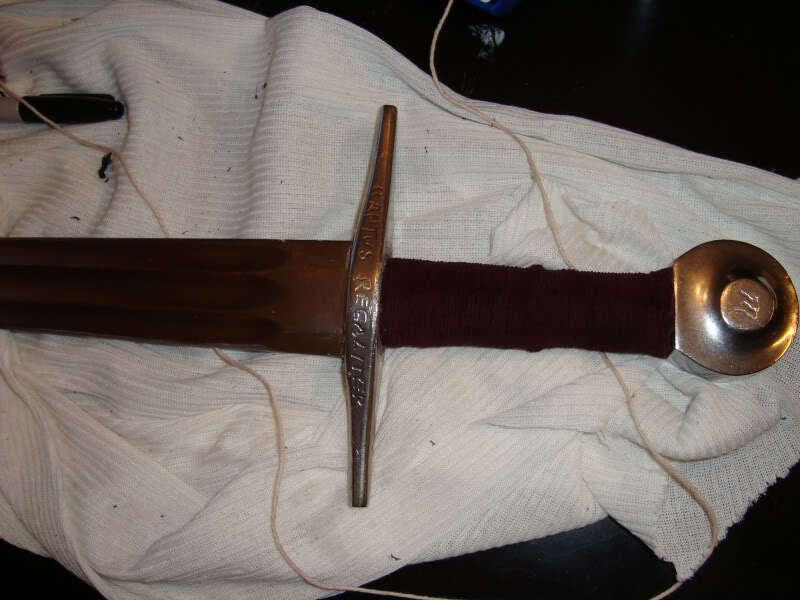 Been busy lately, I was barely done with modifying the hilt of the Henry V that a friend of mine told me he wanted to purchase an MRL Coustille, and that he would request sharpening service on it. 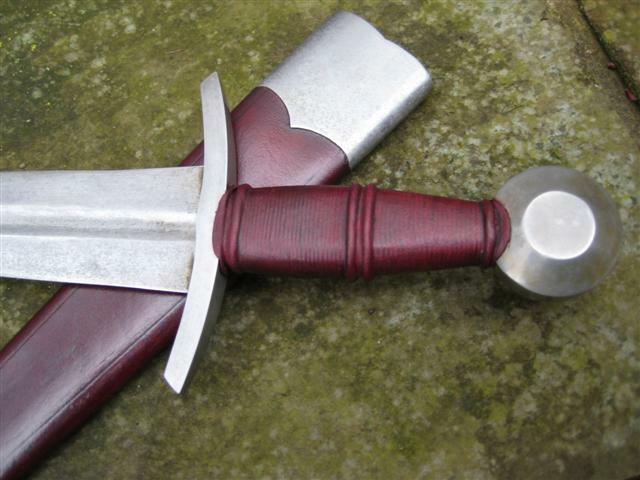 I had ordered a towton with sharpening service before and thought the edge had been done with care, I though the visible bevel reduced the appeal of the sword a great deal. So I ordered a blunt one for him, and did a few modification while I was at it. 1- Established a secondary bevel with a file, then blended it to an appleseed edge. This took a while, but was well worth it. The bevel is invisible unless you use a magnifier, but yet the sword cuts very well (cuts paper with ease but you can hold the sword's blade with your bare hand without cutting yourself). 2- Cleaned the blade of grind marks, repolished to a satin finish. 3- blued the hilt, then use salt and vinegar to etch the blade, hilt furniture’s and scabbard mountings. I wanted to experiment with that, and it really improved the finish. This technique I learned from Sean in the instant antique guide works very well, isn’t permanent and adds a lot of character to the sword. 4- removed the glossy handle leather, placed raisers on the wooden core, and rewrap using chamois. I improved my technique: after two hours of drying, remove the cord around the grip. It will allow you to check if raisers formed correctly, and you'll be able to correct oddities as the glue isn’t dry yet. The most common issue is around the raisers, as when you glue the cord in place using instant glue, it sometimes hardens the cord and can cause ugly things when covered with leather. Sand the cord lightly to solve the issue. I improved the leather overlap too, then put everything back into place, damped the leather with an extra coating of dye, rewrap, leave it for the night...done. The grip would have looked average at best if I hadn't done that. 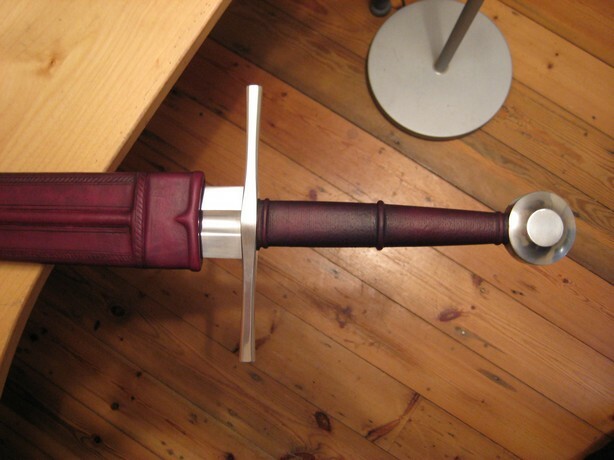 5- Removed the scabbard dye rubbing patiently with solvent, and died it again to match the new grip colour. Really well done Julien! You are really getting good at this; just makes me want to get started on my own projects! As you and some others have shown, some of these pieces can really be made to look much nicer with a bit of work. I have no idea how much labor really went into this. Perhaps its labor cost prohibitive but it would be nice to see more of these upgrades adopted into standard production runs. That is really impressive - 100% improvement on the original sword. When I first compared your "before" and "after" shots, the above quote is what immediately came to mind, verbatim. Bravo, sir! Encore! It's amazing to see the difference that your work has made. The first coustille I wouldn't even consider ordering based upon its appearance alone, whereas the second looks like an quality reproduction. Posted: Mon 13 Apr, 2009 1:43 pm Post subject: Coustel, ou basillard !! Wonderful work my friend, don't forget my futur "payback" : the Encyclopédie Médiévale by Viollet Le Duc ! Thanks for your comments guys. much appreciated! just makes me want to get started on my own projects! You should mate, it's very rewarding. There is something really cool about taking an entry level piece and making it closer to the more expensive replicas out there. I see Windlass steelcraft as the ultimate DIY kit now, providing a solid frame for home improvments: cheap (so that your hands don't shake when approaching the blade with anything more threatening than sandpaper), dismoutable, they also often feature nice hilts furnitures and their blade, thought soft tempered, are appropriate for anything the size of a one handler or below (even if some of their bastards swords proved better lately). 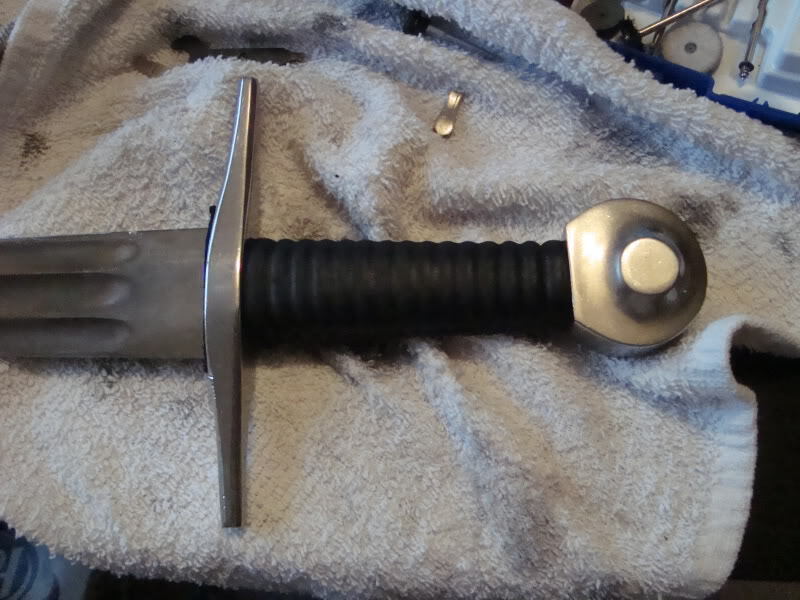 All in all, they end up very nicely with some elbow grease and some patience, plus I have gathered enough confidence to tackle more expensive swords now (just changed the color of my A Crecy grip). I have no idea how much labor really went into this. Thanks Joe. I'd say hours spread accross a all week. (two or 3 per night) But sharpening/repolishing and antiquing were unknown to me and I had to acquire the skills and experimented along the way. 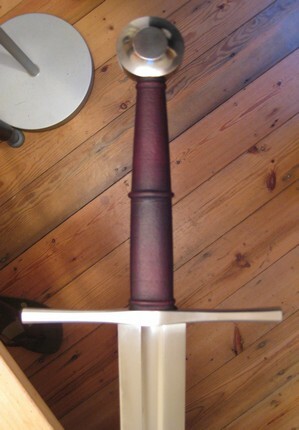 I have gathered enough confidence to tackle more expensive swords now (just changed the color of my A Crecy grip). You seem to be enjoying what you're doing, and that is what is most important. Very nice work indeed. "From costume to custom. Nice work"
I agree with this sentiment very much. Well, Julien, your post was the straw that broke the camel's back. I finally had to do it, I ran to the store and picked up some supplies last night, and spent the next couple hours tearing apart my Cas/Hanwie Practical Arming Sword. It turned into a much bigger project than originally thought when I found out that the risers under the original wrap were plastic, and in fact, the whole handle was plastic, pretty much melted onto the tang. After cutting and sanding off all these plastic risers, I was about to start wrapping when I noticed a weird gap that had been created in the quillon. After filling it with epoxy and cord, started the rewrap. Overall, I'm pleased with how my first try came out, but now I may be feeling the pangs of addiction. Thanks for the incentive! Not as pretty as yours, but I'll keep trying! Also going to try my hand at antiquing the furniture. Notes: I need to clean up the pommel end of the wrap still, and give it a good beeswax buff, also need to finish polishing the quillon after engraving, just too excited not to post. Thanks for looking. Some links of the plastic bits I ran into. Not bad at all for a first go. My Pleasure Michael, and nice grip job for a first attempt (there will be many more I'm sure...once you start...). These hanwei swords seem to have really dodgy construction materials. A plastic handle? Christ...can it be completely removed and replaced by a wooden sandwich one? That would definitely improve the sword further, allowing you to have a more even finish and also you could shape the grip to taper towards both ends, which is an easy win in terms of overall aesthetics. But I have no idea how hard it was to chopp some of that plastic off, judging by the pictures it looks like that wasn't too easy. That flatten pommel reduces the appeal too, but I seem to remember reading that those were hollow so they can't really be reshaped to something more round. Looking at the picts again and considering the proportion of the hilt, I think you could go for slighlty thicker raisers that would end up shaping the grip a little bit more. How did you do the carving? With chisels? Dremel tool? Funny I also had in mind to give it a go at some point. It looks a bit crude, but not inapropriate for that type of sword and I'm sure that with some antiquing it will blend in nicely and will look very good. Do you have some bluing paste? I'd use that and then use vinegar and salt on the top. Just tried this combinaison and it works very well, giving a deeper/richer result than salt and vinegar alone. After bluing, you usually rub the surface with steel wool (or with a sponge depending on how well the metal takes it) to even the color, but in the recesses created by the letters, a dark tone would remain, making those letter stand out. A lasy solution could be to use something else, like shoe polish or an ink wash, to darken the recesses. Make sure to post pics to see how that goes. Changing the grip colour of the sword to fit that of the scabbard made a huge difference IMO, the two objects now seem like components of a single "unit". I must admit that I'm very impressed with your upgrades (scabbard, grip colour) to the sword as it was received from Albion. Please do post pictures again when you have received the scabbard chape (and added a suspension system, if you opt for that) - I'd be very interested to see them. I gots the MRL 14th century long sword that I oil blackened the hilt and pommel and redid the wire wrap in copper and mild steel wire. Now I need to know the riser part.